THIS year Australia rose to No.1 in the world in the Test arena and then suffered five straight defeats in the five-day game. The West Indies also won both the men's and the women's World Twenty20 titles and Bangladesh beat England in the Test arena. Things won't be any easier to predict in 2017. That doesn't mean we won't give it a go. From the rise of a new Australian spin prodigy to next summer's Ashes Down Under, we've got it covered in our predictions for 2017. This isn't so much a comment on Australia's ability against spin as it is an opinion of how good India is at home. The Indians have not lost a Test at home since 2012. Since Virat Kohli took over as captain they have won 10 of their 12 Tests in India and one of their two draws only had a day's play because of rain. Right now India's spin twins Ravichandran Ashwin and Ravindra Jadeja sit first and second on the International Cricket Council's Test bowling rankings. The pair will be licking their lips at the prospect of taking on a country that has lost its last nine Tests in Asia. We're backing Smith's side to get the job done against England next summer. Australia has had a bad year in Test cricket in 2016 but so has England. In fact, England has lost more Tests this year than any nation in the world, tasting defeat eight times in 17 matches. His tactical nous has been questioned by some, but Smith has excelled as a batsman since taking over as Australia's captain, with an average of 70.14 across 18 Tests (before the current Pakistan series). He is a man who leads by example, setting high standards with the bat and in the field. Going by his performance at the 2015 World Cup (402 runs at 47) he doesn't have any trouble stepping up for the big occasions either. Smith will go into the new year sitting atop the International Cricket Council's Test batting rankings but don't be surprised if he loses that title to Kohli at some stage next year. The Indian skipper sits second on the rankings and trails Smith by 43 points. That's not a small gap - the top three bowlers are only split by 20 points - but right now Kohli is in the form of his life. The 28-year-old hit three double centuries in 2016 and averaged a remarkable 75.93 for the year. Despite boasting the most wickets of any Australian finger-spinner ever, Lyon is seemingly always one Test away from being dropped. Expect concerns around his form to come up again in time for the Ashes and expect him to once again silence the doubters. This year Indian spinner Ashwin became the second fastest man to ever take 200 Test wickets. Next year we're tipping him to be the fastest to reach 300, breaking Dennis Lillee's 56-Test record. Ashwin has already taken 248 wickets across his first 44 Tests, meaning he only needs 52 wickets across his next 11 Tests to usurp Lillee. Spin is king in India and it would be incredibly bold for Australia to play in the subcontinent with only one front-line tweaker. Short of picking five specialist bowlers - risky considering Australia's recent struggles against spin - in order for Australia to play two spinners the side can only feature two out-and-out fast bowlers. And considering how tough conditions are for quicks in the subcontinent this means one of the batsmen has to be a handy bowler. That's where Mitchell Marsh comes into the equation. The 25-year-old is below Hilton Cartwright on the all-rounders pecking order at the moment, but the latter is still unproven with the ball, having only taken 15 first-class wickets at an average of 41.93. Marsh's bowling average in the Test arena isn't much better (37.37) but he's proved himself more than capable of holding up an end with an economy of 3.47. In Asia where Test cricket is often a battle of attrition that might be all Australia needs its fifth bowler to do. Having missed much of 2016 because of an elbow injury - he hasn't played since July - de Villiers will go into 2017 the freshest he has been in years and with any luck for South Africa as hungry as he's ever been. That's bad news for bowlers around the world. It's been a tough year in Tests for England but the side has done quite well in ODI cricket with 11 wins and only four losses. And since Trevor Bayliss took the reins the side has won five of its seven series. In 2017 England hosts the Champions Trophy and Eoin Morgan's side has a good chance of winning it. Boasting a powerful opening duo in Alex Hales and Jason Roy, one of the world's elite batsmen in Root, the super-talented Ben Stokes and plenty of bowling depth, England has all the firepower it needs to win the game's second most prestigious one-day trophy. It's been more than five years since Cummins played his first and only Test and since that famous debut he's had three stress fractures in his back and one in his foot. Now 23 years old, Cummins is entering the stage in his career where stress fractures generally subside. Throw in the fact he's remodelled his action to take the stress off his back and that Cricket Australia is taking a safety first approach with him and there's enough there to suggest he'll enjoy a healthy year on the park. This may not seem the boldest prediction but Maxwell hasn't played an ODI for Australia since June 2016, with selectors calling on the gifted 28-year-old to perform more consistently. Maxwell's path back into the side isn't an easy one, especially with the rise of Travis Head, but he is too good to remain on the outer with selectors in the long term. After all, it was only in January that he was named Australia's ODI player of the year. Weighing in Maxwell's favour is the fact Australia is pencilled in on the Future Tours Program to go on an ODI tour of India next October, where his skill as an off-spinner should prove valuable. There's a strong argument that Mitchell Starc is already Test cricket's best fast bowler but by the end of next year he'll have the ranking to prove it too. 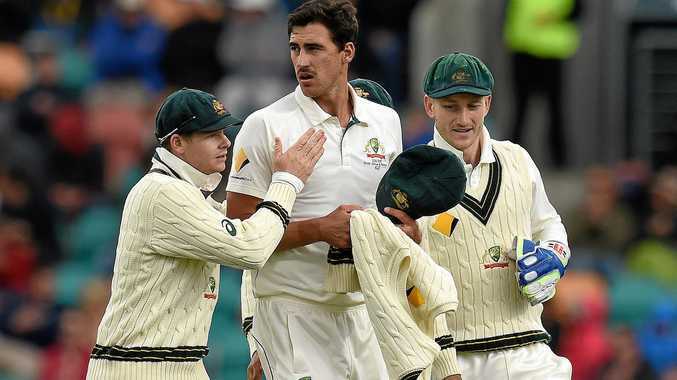 Starc currently sits sixth on the ICC's bowler rankings, with the only fast bowlers ahead of him being James Anderson and Dale Steyn, who were both plagued by injuries in 2016. Starc was also affected by injury, missing Australia's tour of New Zealand because of ankle surgery and going into this summer short of match fitness after lacerating his knee in a freak training accident. Despite this he is still on track to register his best year yet in Test cricket, with 45 wickets at 21.51. Imagine what he could do in a year free of injury. He looked good at the Gabba and this year he hasn't been helped by some rather abject fielding by his teammates, but the fact is Amir has not returned to Test cricket the same bowler, with his bowling average for the year swelling to 35.80. That's understandable. No matter how talented you are, five years without cricket is going to have an impact on your bowling. The encouraging thing for Pakistan is that there have been signs that Amir could still go on to be a very special bowler, with his pace, control and swing improving as the year has gone on. Indeed, his bowling average has improved in each series he has played. In his first series back he averaged 42.41 in England. In October against the West Indies he averaged 38.50. In New Zealand a month ago he averaged 28.57. Expect big things in 2017. You may have already heard of Nair. He's the New South Wales Blues' "mystery spinner” who learnt to bowl the carom ball off YouTube, dismissed Faf du Plessis and is a considered a highly promising batsman. He didn't get a game in the first half of NSW's Sheffield Shield season but it would be a small surprise if he didn't play in the second half when Lyon and possibly Steve O'Keefe are away on Test duty in India. Either way, we're expecting the BBL to be where he makes a name for himself. The 18-year-old is already on a full contract with Sydney Thunder. Matthew Wade's work with the gloves has improved noticeably and the energy he brings to the Test side is obvious. Still, Nevill remains the better gloveman and was unlucky to get the axe for his work with the bat considering how often he was being asked to come in and fight fires because of a malfunctioning batting order. The right-hander bounced back from his Test axing by rattling off an unbeaten 179 in the Sheffield Shield and if he can maintain that form when the first-class competition kicks off again he should be right in the mix for selection. Piers Morgan loves English cricket and he loves Kevin Pietersen. Unfortunately for him the two things don't always go together. Nevertheless, expect Morgan to push as hard as he can for Pietersen's recall to the Test side. We made this prediction last year except KP was 35. We expect it to come true again.